The most impactful trainers are those who always seek to improve their performance. Training delivery is just one aspect of working as a trainer, but it’s one that will make or break the effectiveness of your training sessions. There are so many elements to consider when delivering training. It can be helpful to have a mental checklist for preparing and delivering excellent sessions every time. Here are 8 handy tips for optimising your training delivery performance. Think about who you are delivering training for. Your audience affects so much about your presentation; the tone, the delivery style, the use of humor (or not! ), so take time to consider your audience. Keep slides and handouts clear and concise. Avoid too much text or clutter to ensure the audience can focus on your message. It’s fine to use PowerPoint as a reference point or touchstone, but to keep your audience engaged, avoid the pitfall of simply reading from your slides. This is linked to, but also distinct from to the “avoid clutter” step. Only use slides, content and visual aids relevant to what you want to achieve. Avoid adding content as “padding”. This is distracting and takes focus away from what you want to achieve. Make sure you know your presentation inside out. The more familiar you are with the structure of your presentation, the more confident you will be delivering it. Try to anticipate what kinds of questions may be asked and prepare for these in advance. When designing and delivering a presentation, it’s easy to get “too close” to the material. Ask a friend or colleague for feedback on the presentation itself and on your delivery style. Try to get a great night’s sleep before your presentation or speech. Don’t skip breakfast, lunch or whatever meal comes before your speech. Where possible, take some quiet time before you speak. By far, the best way to develop and fine-tune your training skills is to attend our intensive Training Delivery & Evaluation Course. Over 5 days, you'll get to grips with the essentials of training delivery, and receive helpful guidance and feedback from our experienced trainers. 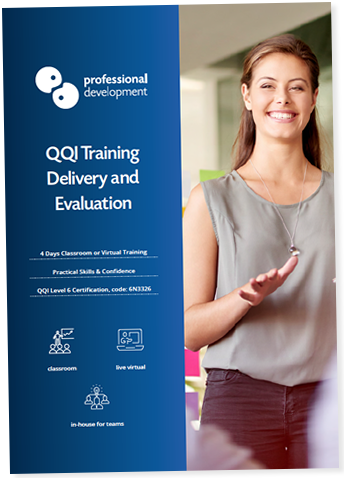 To get started, click below to Reserve Your Place, or Download our Training Delivery and Evaluation course brochure.